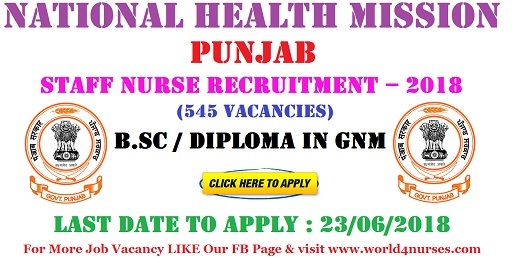 National Health Mission Punjab Staff Nurse (545 Vacancies) Recruitment – 2018.The constitution of India envisages the establishment of new social order based on equality, freedom, justice and dignity of the individual. It aims at the elimination of poverty, ignorance and ill-health and directs the State with regard to raising the level of nutrition and the standard of living of the people, securing the health and strength of workers, men and women, and especially ensuring that children are given opportunities to develop in a healthy manner. Interested and eligible candidates can apply. More details given below. 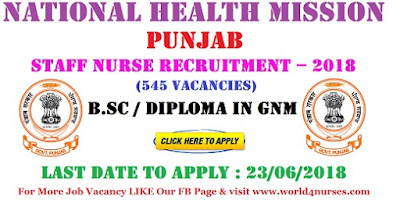 National Health Mission (NHM) Punjab recruits Staff Nurse posts. B.Sc., Diploma in GNM candidates can apply. Educational requirements : Diploma in GNM from a recognized institution, Registered with Punjab Nursing Registration Council OR B.Sc Nursing from a recognized institution. Registered with Punjab Nursing Registration Council. General instructions : No TA, DA will be paid for the journeys performed for the written test/ counseling. The candidates applying for more than one post shall have to apply separately, along with necessary fee. The date, time and venue of the written test shall be communicated to all candidates through website:- http://bfuhs.ac.in and http://www.pbnrhm.org/career1.aspx. For any assistance, please contact at 0172-4012019 & 4012021. Female Staff Nurses Vacancies for Military Hospital in Saudi Arabia.